Our Lady of the Hills Catholic Church begins as a vision in the heart of Father William Croghan, then Pastor of St. Peter’s Church in Columbia. Father Croghan, together with a “committee of six” parishioners, took the mustard seed and sowed it in the field in the Irmo-St. Andrew area in 1972. At this time, some 1/3 of St. Peter’s parishioners lived in this area. Their desire to come together as a Christian family, coupled with an obvious need for a local Catholic Church to serve the many suburban families who were not participating in parish life, indicated that the time was ripe for planting. Bishop Unterkoefler also was eager that the Church grow and spread into urban Columbia. Weekly Masses were celebrated in Lexington and at the Irmo Elementary School and later at the Dutch Square Theater. When Miss Nellie Lynch left a large inheritance to the Church, property was purchased in Irmo, a house with four acres on Nursery Road. The Mission Community – still attached to St. Peter’s Church – began to develop roots of its own. In June of 1973, Father Croghan was transferred and a full time Pastor, Father Henry Burke was appointed to the newly-titled Irmo-Lexingtion Catholic Community. It was officially separated from the Mother Church, and arrangements were made to reimburse St. Peter’s for the Irmo property. A Parish Council was elected and George Holmes was elected its first chairman. Parish life was sprouting in all directions. Coordination of the many services required by the community was organized by Rita Dalton under the name of concerned laity. Milly Raible assembled an ambitious program of Religious Education from preschool through adult, and classes were held regularly at Seven Oaks Presbyterian Church. A Liturgy Committee was formed to coordinate and develop the various aspects of worship. CYO, Boy Scouts, and Neighborhood Units were formed to stimulate Christian fellowship. As a parish policy of out reach, a Mission Committee was appointed to direct the parish tithe (10% of the weekly offering) to meet needs outside the parish. Office space was rented and a part time staff was assembled. Margaret Shull was hired as Director of Religious Education, Lucy Cunningham as Secretary, and Frank Schmitt as Bookkeeper. In October 1973, the site of weekly Masses was moved to Jamil Shrine temple. By the end of its first year the parish had chosen a new name, chosen by popular vote – OUR LADY OF THE HILLS. Meanwhile, a larger, more suitable tract of land was acquired through the generosity of Mr. H. W. Hoefer as an exchange for the Irmo property, allowing the parish to continue to use the house as a rectory. In the Fall of 1974, a Building Committee was formed with Bob Cunningham as Chairman. John Tabb Heyward was hired as the architect. On a rain-soaked Sunday in February 1975, ground was broken by the Bishop for the $215,000.00 church sanctuary. With the summer of 1975 came a change of leadership. Father Michael Burton was appointed Pastor. Throughout the year, the community looked forward to the day of the completion and occupancy our own new home. The formal dedication Mass was celebrated by Bishop Unterkoefler on November 26, 1975. When the call went out for volunteers for outdoor work, the spirit of of the community which had been growing, became evident. Parishioners worked together week after week clearing the land, pouring sidewalks, clearing the cemetery, preparing the parking area, and planting grass and shrubs. Not only did the people give their time and labor, but the special gifts committee was gratified by the response of the parishioners to the request for gifts of furniture and furnishings. Everything to be seen as one looks around the church was donated. As the church community grew in numbers during 1976, it became necessary to increase the staff. Sister Susan Kresse arrived in August to take up her duties as Pastoral Associate. In the Fall, another secretary was hired to help with the growing volume of paperwork. Parish activities continued to abound in 1977. The first edition of a monthly parish newspaper, HOLY SMOKE, was published in February. There were more than 60 councils, committees, groups, and clubs functioning in the parish at the time. Mass attendance increased as over 825 families gathered each week to celebrate Mass. Earl C. Mueller was ordained to the priesthood in May, the last of the seven sacraments to be celebrated in our church. In November 1977, Father Gerard Armstrong, S.J. came to Our Lady of the Hills as Associate Pastor. With over 900 families involved, the Religious Education Program flourished, using rented facilities. Planning a parish center to house the many activities of the parish – especially Religious Education – came under study. In 1978, the Lexington Mission with approximately 100 families, dedicated their new church, Corpus Christi, on November 25. In Chapin, 30 families began celebrating weekly Mass at the Old Methodist Church with the hope of becoming a mission. In 1979, Father Fred Suggs became Associate Pastor at Our Lady of the Hills, replacing Father Armstrong. In that same year, Chapin was officially made a mission of Our Lady of the Hills with Mass being celebrated at St. Francis of Assisi Episcopal Church in Chapin on Sundays. Chapin also had their own Religious Education Program. A home was purchased and moved to a site on Our Lady of the Hills property in September, 1979. This home was renovated and became our rectory. Plans continued for a Parish Center to accommodated the needs and activities of our parish. 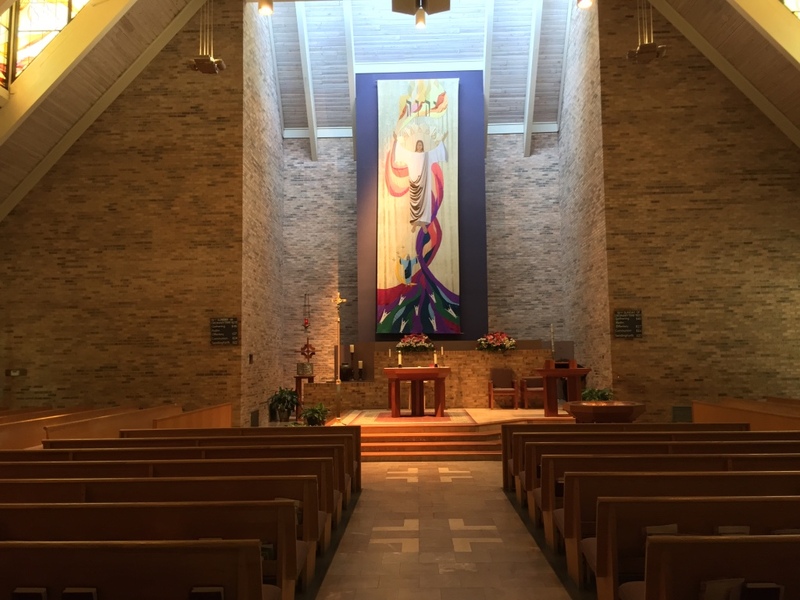 In June 1981, Father Burton and Sister Susan were transferred and Father Frederick Masad was appointed the new pastor of Our Lady of the Hills. In August, Jim McCarty, became the Director of Religious Education. In the Spring of 1982, we received permission from Bishop Unterkoefler to purchase Timmerman School for use as a parish center. Volunteers from the parish gave long hours of their time and talents to clean and paint the center. The move from the trailer office to the new facilities was made on July 14, 1982. The Center was named for Father William Croghan, the first Pastor of Our Lady of the Hills. The Croghan Center houses the church offices, work rooms, meeting rooms, and Religious Education classrooms. In November 1982, the Chapin Community became a mission of St. Mark’s in Newberry. Father Henry Burke was named as Pastor. The needs of an expanding parish were further satisfied by the addition of a Narthex to the Church. It was used for the first time during Holy Week and Easter of 1984. The marble baptismal font in the Narthex is the gift of Mr. and Mrs. George Hirsch. Father Masad was transferred in June, 1987. Msgr. Louis Sterker was assigned as Pastor and Father Roy Aiken also joined our parish as Parochial Vicar. In April 1988, the white marble statue of Our Lady was presented to the parish by the Ladies Auxiliary of the Knights of Columbus. In October 1989, Donna Tomasini was named Director of Religious Education when former Director, Jim McCarty, left to take a position in the diocese. In March 1990, Msgr. Sterker and Father Aiken were transferred to Charleston and Father Robert H. Fix was assigned as our new Pastor. On April 7, 1990, one of Our Lady of the Hills Parish members became a member of the priesthood. Gerard (Jerry) Ryfinski was ordained by Bishop David Thompson at the Cathedral of St. John the Baptist in Charleston. He celebrated his first Mass as a priest at Our Lady of the Hills Church on Sunday, April 8, 1990. In 1993, Our Lady of the Hills Church was completely renovated. The main architect was Bill Brown of Colorado Springs assisted by Jerry Abrams of Rock Hill and Mashburn Construction Company. The renovation included pews, sanctuary with new altar, pulpit, chairs, lector stand and baptismal font. Also included were new lighting and sound systems, interior painting, renovation of the organ, a working sacristy, reconciliation room, new bathrooms and storerooms. The new stained glass windows were installed in 1994 around Christmas time. All renovations have been completely paid for. Now that the renovation is complete, Bishop David B. Thompson will rededicate the church on this anniversary. With hope in God, we look to the future and the building of our new parish center. The theme of the textile banner is the Resurrec tion and Redemption – Christ’s victory over sin and death, and man’s new birth into the kingdom of God. God the Father is identified by the letters, “Yahweh.” God the Son is seen in the glorified Christ figure. God the Holy Spirit is symbolized in the flame motif throughout. Mary, for whom our church is named, is seen in blue, crowned Queen of Heaven. The crescent moon at her feet is a symbol of Mary reflecting the glory of the Son of Righteousness, a title prophesied by Malachi for her Son, and shown behind the head of Christ. The seven white-robed figures, marked with the sign of the cross, represent the Body of Christ, the believers who, through faith, are reborn into the Father’s Kingdom. Seven is the Hebrew number of totality or completeness, indicating that God’s plan of salvation is extended to everyone. The redeemed ones come to the Father by way of the Son, by the purple, blue, and green section. They progress and mature through the purifying fire of the Holy Spirit, symbolized by the gold section. The entire spectrum of color is used in the banner to show the complete work of redemption. The colors progress upward to indicate the transformation of Christians from darkness to light, from death to victory. The banner, nine feet by twenty four feet (9 x 24’) was designed by Marilyn ej and hand-appliqued by ladies of the parish as an offering of love and a declaration of faith. The Lenten Chancel Hanging, designed by Mark Valk, is the story of Jesus’ journey to Jerusalem through the Passion and Calvary, and on to the Resurrection, symbolized by the empty tomb. Sewn by LaLone Augustine.